Tea stands for unhurried pleasure, for a conscious break not only for women but also for men who are also getting addicted to it. In many countries today, the consumption of tea has grown exponentially, becoming just as important as the drinking water. It is served all over the world; 50% of Americans consume tea on a daily basis, mostly in the form of iced tea. Tea also benefits from its healthful properties and the adaptibility of its various flavour profiles. Hot or cold, tea consumption is spreading out of the home: not only in restaurants and bars but also more and more in coffee shops where the selection has been enlarged lately. 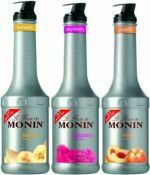 MONIN has selected the best ingredients for a natural tea taste; MONIN Tea concentrates offer unparalleled ease of use, with no equipment needed, for unlimited tea applications and great margins!